The greatest compliment you can give us is to refer a family member or friends. Successful practices don't just happen. It is a result of a strong commitment to excellence in our treatment and in our relationships with the doctors and the community of families we serve. We are continually amazed to find how many new patients call based of your recommendations. We would like to thank you for showing your confidence in our practice by referring your family, friends and colleagues. When you refer a new patient to our office you and your referral will receive a $50 credit towards your services. 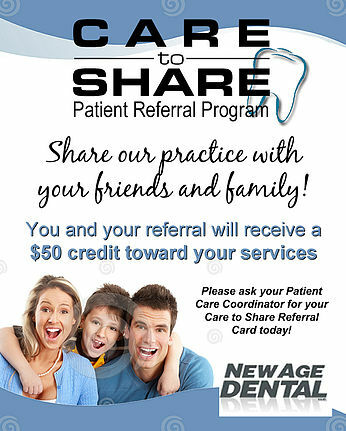 Please ask your Patient Care Coordinator for a Care to Share Referral Card to pass our to friends and family.